Hello there! It was about this time two years ago that I, with my parents, took a trip to The Range in Norwich to pick up my supplies for University. This seems like an absolute age ago, but I remember the struggle of thinking, hang on, what do I actually need? I thought I would share with you what I found really useful, and a few helpful tips I've picked up along the way. As I said I bought most of my things at The Range, and places like this or Wilkinsons are great to buy the majority of your supplies from. With the kitchen what you need depends upon what sort of place you are moving into (Halls, shared house etc.) In Halls we had things like a kettle/toaster/microwave already there for us, but for my house last year we needed to buy a kettle and a toaster. Saucepan- you only really need one of these, if you happen to require two at the same time people are normally quite happy for you to borrow theirs- but make sure you ask them first! Cutlery- if you can, take some from home, if not, just buy whatever's the cheapest. You'll find that cutlery gets mixed up/gets lost- especially teaspoons! It's better to have more than one of everything as either you will need another fork for something, or you'll have a friend round and they'll require cutlery. Glasses/Mugs- in my room in halls I would keep glasses that were cheap in my cupboard in the kitchen, and then mugs that I didn't want to get broken in my bedroom. Not that I didn't trust people with my mugs, but you'll find that people will come round for pre drinks who will require a glass, and it's always easier if you have a few cheap glasses around that you can give to them as not everyone will remember to give the glass back. Plates/bowls- I took two dinner plates, three side plates, and two bowls when I first moved in. As with cutlery, make sure you have more than one of everything; not only for yourself but if you have a friend round. *Bakeware- I've put this with an asterix as obviously not everyone in into baking, but I knew that I would still like to carry on this hobby when I went to University. I bought a plastic mixing bowl and a small electric handwhisk. My mum gave me one of her cupcake tins, and I already had my own scales so brought those with me. Timer- if you're anything like me, then you're used to using a timer that is built into your cooker. Obviously this may differ at uni's/houses, but neither my cooker in my house or my one in Halls had a timer on. Some things are easy to time just using your watch, but I always like to use my timer if I have to put something in for longer so I don't forget about it and I actually remember to check what I am cooking/it doesn't matter if I forget what time I put it in the oven. Fairy Liquid/sponges/bin bags/kitchen roll- things like this everyone will take, but they are the types of things that you'll end up having to buy eventually when it's your turn, so it's not going to hurt to have them in stock! Knives- you can get a block of knives quite cheaply, and I'm still using the same knives as I took with me in the first place! Tea Towels- again everyone will probably bring these, but it doesn't hurt to have your own to use! You may decide as a flat/house to share these but you'll always need some whilst the others are in the wash.
Non-Perishable Food- now how much food you take will depend on how much space you have in your car. I took cupboard food items such as soup/beans (whatever they say, students do not only live off of beans- I actually rarely have them!) and things that wouldn't go off quickly. You can buy more fresh food when you arrive- it might be nice to take a trip as a flat/house to the nearest supermarket together! Scissors- kitchen scissors can be used for anything and everything. I remember my flatmates thinking I was weird for cutting up a pizza with scissors but then they realised how easier it actually is than using a pizza cutter! Plastic storage containers- nothing's better than knowing you have a stock of stuff in the freezer! You might decide that you want things like potato mashers etc, but if you're unsure whether you'll actually use these you can always wait until you get there and buy one! Photos, photos, photos!! !- I can't stress this enough. Nothing will make your new room feel more homely than putting up your own photos. I had photos that covered my wardrobe, and then I printed out some inspirational quotes and pinned them to the pin board that was above my desk. Duvet/matress topper/sheets/pillows- Most uni rooms have single beds in them, so I had to go out and buy some new duvet covers (we had a single duvet in a cupboard from when I was younger) and I bought some more pillows. If you have a double bed at home, I wouldn't go crazy with the single duvet covers as this is probably the one and only time that you're going to use them! Lamp- now this is something that I didn't actually take with me as I wasn't sure what the lighting arrangement was in my room and whether I would need one or not. I didn't need one for working as there was a separate light for my desk, but I found that I wanted a lamp to sit next to my bed to use first thing in the morning/in the evening. Hangers- yes you will have a wardrobe in your room, but no it will not have hangers inside them! There's nothing worse than turning up and on unpacking your clothes you're unable to hang them up. (This didn't happen to me but I know quite a few people who forgot to take hangers with them). Stationary- don't forget that once you get there and start to settle in that you'll actually have lectures etc to go to! Make sure you remember to take pens/pencils/paper/ruler/highlighters etc as you'll find that you'll need them straight away. Extension lead- you'll find that you'll have quite a few things that you want to charge up/will require a plug, and with the small amount of plugs available in your room an extension lead is a must. Blanket- nothing is more necessary for those afternoon naps! DOOR STOP- I've put this in capitals as this is an absolute essential!! You'll get to know your flatmates a lot quicker if your door is open and they can walk past and chat (obviously this doesn't need to be open 24/7). I have a cat doorstop, but I found that I had to use a thick piece of folded card to actually keep the door open, as it was a fire door. Blu/white tac- to stick all your photos up with! Most uni's require you to use white tac, but I found this left more of a mark than blu tac did! Printer- you can use the printer's in the library, but having a printer in my room was a god send. It meant I could easily print out lecture material/essays and not have to worry about getting to the library in time to join the queue for the printer! Electrical items- camera, phone, laptop, USB stick: do not forget these! Clothes- clothes wise you will need quite a bit; don't forget that you are going to be there for the majority of the year! That being said even if it's bright sunshine and you're out in shorts, don't forget to take winter clothing as you'll thank yourself for it a few months down the line. Also don't forget your dressing gown! 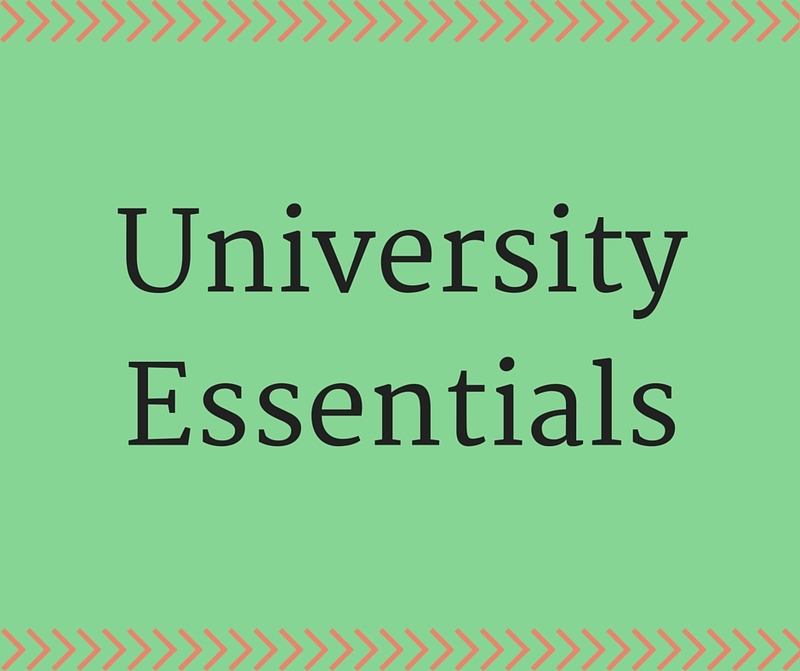 Necessary documents- do not forget things like your passport/contract for your accommodation/student finance correspondences as you'll probably need them all! Laundry basket- I had a fold away one that easily sat inside my wardrobe. This is especially useful if the laundrette is not inside your building and so you need to be able to carry your washing/washing liquid somewhere. First aid box- it doesn't have to be an official first aid box, but make sure you take things like plasters/paracetamol that you will need. Kettle- this is not a necessity, but I took a kettle with me to live in my bedroom. There are times when you just want a cup of tea, or a pot noodle and the kitchen seems like too much of a trek. Towels- take more than one so you have a spare whilst one is in the wash! *Basket- in Halls I had my own en-suite bathroom so could put all of my things out in the bathroom as obviously there was only me using it. Now that we share a bathroom in our house, I keep things like skincare/toothbrush etc in a little wicket basket under the sink. *Shower Curtain- this will depend upon what your uni/landlord provides. Toilet Roll- there's nothing worse than arriving and needing a wee after travelling for so long, to only find you have no toilet roll with you! I hope that I've thought of everything, but if you want an even more detailed list then you can have a look at this one! If you can think of anything else that you think is essential, then please leave it in the comments so others can see. If you are off to University this year then I hope you have a fabulous time. Check back soon for more in my University mini series! Makes you wonder how it all fitted into the car !